2 flute, carbide tipped with totally enclosed ball bearing guide. For use in cutting slots (kerfs). Bits #5364/#7664, and #5361/#7661 are designed for precision biscuit joinery (See biscuits). Also use for shiplap joints, tongue and groove joints, T‑moldings, rabbeting, etc. *Items #5364 and #7664 can be used for a #20 biscuit, plus a #10 biscuit with bearing #248 and a #0 biscuit with bearing #249. #248 and #249 bearings are sold separately.Click HERE TO SEE BISCUIT CHART. 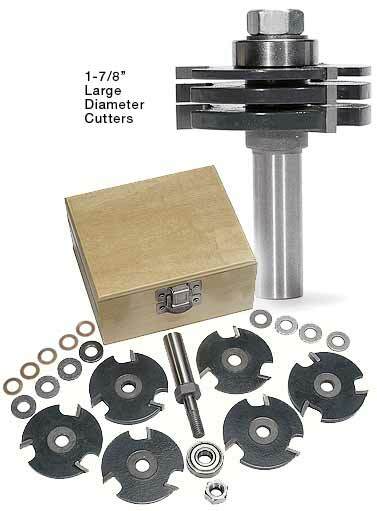 Buy as individual cutters or as a complete assembly that includes the arbor and bearing. Three wing carbide tipped with 8mm (approximately 5/16") bore, and 1‑7/8" large diameter. 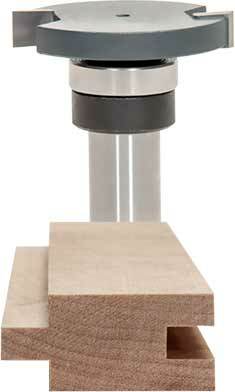 Cuts 1/2" deep when used with our arbor and bearing. To reduce depth of cut use larger bearings (see the chart below). See the biscuit slot cutting chart. I purchased the #7651 Set over a year ago and just used them on a large project. All I can say is "Wow". Really worth the investment. 2 flute, carbide tipped with totally enclosed ball bearing guide. The top mounted bearing is ideal for cleaning out old tongue and groove flooring and for applications where a standard bottom bearing on a slot cutter is in the way. Also great for cutting T‑slots, or small, slat wall type grooves. Bought the 7671 router bit (top mounted cutter for 3/8" deep and 1/4" high groove on 1/2" shank). Used it in laying maple and walnut hardwood, to make a perimeter groove around a diagonal field (about 70 feet of continuous groove), for creation of a border and then for creating a radial pattern around the border (for the latter about 600 short pieces of maple needed an end groove). Excellent cutting and consistency, remains sharp after all of this! works well freehand routering and in the table. When you need to groove end grain short pieces use a proper coping sled. 2 wing carbide tipped with 5/16" bore. 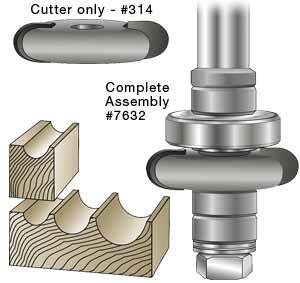 Buy as individual cutters or as complete assembly with arbor and bearing. Cut flutes on the edges of curved pieces. Stack different cutters to create a stepped flute for a decorative edge or molding, or stack multiple cutters to create miniature fluted moldings for clock cases, small bookcases or cabinets. The 1/2" arbor has 1‑7/16" length for cutters, spacers and bearings. Create a wide variety of grooves with this set. SAVE $11! Versatile, carbide tipped three-wing Stackable Slot Cutter Set cuts a wide variety of grooves. 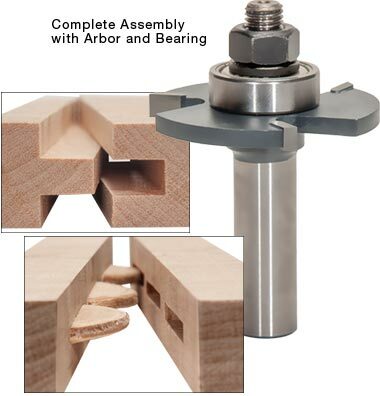 Simply adjust the arrangement of the cutters and shims on the 1/2" arbor to create a wide variety of groove sizes for dadoes, tongue and groove joints, rabbets, or biscuit joints. 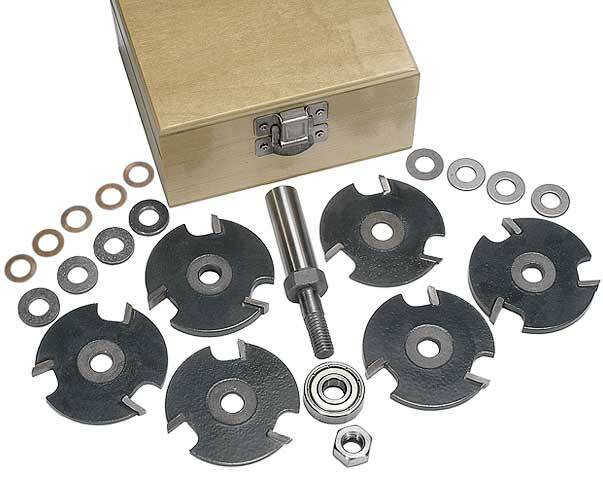 With the included 6 carbide-tipped slot cutters (1/16", 3/32", 1/8", 5/32", 3/16", and 1/4"), shims, and bearing (7/8" OD x 5/16" ID) for 1/2" cut depth, almost any groove from 1/16" to 11/16" can be created. Individual cutters can also create precisely-sized grooves. Click here to view or purchase additional bearings to adjust the depth of cut. Storage box included. SAVE $11! With 1/2" arbor. SAVE $10! For changing depth of cut. Includes 5/8", 3/4", 1‑1/8", 1‑1/4", 1‑3/8", and 1‑5/8" O.D. bearings. Clean cuts as per the specifications– quality materials and tight tolerances. First use was to cut a 3/8" slot in the bottom of a solid door. The door was a Simpson with engineered wood and veneer. Grain running in multiple directions along the length of the cut was no issue. The only suggestion would be to protect the exit end of cuts with a block clamped in place to avoid blowout and, in some cases, cut with the direction of bit rotation to avoid exit side splintering. Regardless, the set performs at a level to be expected from premium grade tools.